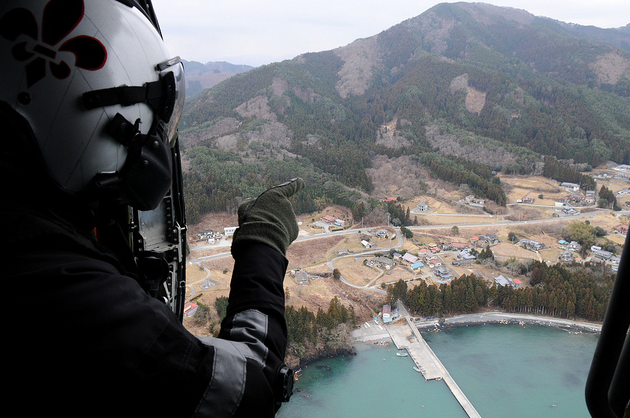 America’s quick, powerful response to Japan’s crises has touched many hearts here, and the choice of name is charming: Operation Tomodachi, which means Operation Friend. Excellent touch, just the kind of goodwill everybody here needed. A neighbor woman not known for public displays of emotion hugged me with tears in her eyes, and said she wanted to express to all Americans her appreciation for what they’re doing for Japan. I felt proud of my countrymen. When the USS Ronald Reagan Carrier Strike Group arrived, people jumped for joy. What could inspire more confidence at a time when so many feel helpless and alone? The group flew 29 sorties yesterday, delivering 17 tons of supplies such as food, water, and blankets to the worst-hit of the disaster zone. So far, it’s delivered 25 tons. The American presence is discussed widely, and warmly. Trouble at the Fukushima nuclear power plant continues. With intense emotion involved, and a tendency toward hyperbole in media, I’ve begun focusing on raw data instead of interpretation. Taking that approach, let’s examine the situation as of noon Wednesday, Japan time. The top bullet summarizes the area closest to me. The first line describes the location. The second shows that, as of March 16, 12 pm, radiation exposure was measured at 0.224 microsieverts per hour. The third line shows in parentheses that a typical X-ray scan exposes a person to 60 microsieverts. The next bullet group shows an area of Tochigi closer to the reactor (but still more than 100 miles away) measuring 1.40 microsieverts per hour. These are not dangerous levels — not even close. Other data I’ve seen suggest that people will not become ill until radiation levels reach 1.5 million to 2 million microsieverts. We’re nowhere near that, and almost nobody expects to get there. To see current data, check the second group of info at the Tochigi radiation page. Note that it uses military time, so 10 pm will display as 22. The arrows show wind direction and their colors correspond to the meters/second shown at bottom right. You can forecast by pushing the forward arrow at the top where it shows 16 and 12 (March 16, 12 pm). The upper-left pulldown takes you to different region zooms on the map. 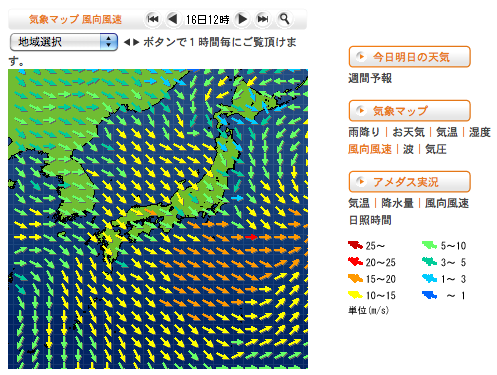 The image above is static; visit the live, interactive map. When you do, notice by forecasting with the forward arrow button that the wind’s supposed to keep radiation flowing out over the sea. Great! What’s more, it’s a fairly strong wind. Thus, with very low levels of radiation and a strong wind out to sea, I find the situation facing Tokyo to be less dire than depicted. It’s possible that it will deteriorate, of course, but it’ll probably get better. US Energy Secretary Steven Chu said yesterday that more than 30 experts from the Energy Department and 17,000 pounds of monitoring equipment for early detection of ground contamination had been deployed to complement Japan’s efforts. The laudable civility of Japanese citizens is holding strong. Rolling blackouts are scheduled every day, but with people following requests to self-ration their energy consumption, most haven’t been necessary. Nobody complains, they just dial down electricity usage and adjust their lives accordingly. Ditto the response to gasoline shortages and emptying food shelves. An air of camaraderie permeates the tragedy. These are good people in bad times, but they’re going to get by with a little help from their friends. I would like you to keep in contact, if possible with my son. Michael was with the Nuclear people here for sixteen years after leaving the navy as a nuclear chemist aboard a sub. He keeps me and my group informed with information received from the Chattanooga TVA Nuclear people which is much faster than the local news. He is an Oracle Guru presently. Thanks much, your info plus his gives all of us here a much clearer picture. God bless the people of Japan and all those there for the rescue! Jason — thanks for clarity in a time of hyperbole. Hopefully all of those close to you are safe and have not suffered more than minimally in the literal wake of this trifecta. Japan is in our prayers as well of the prayers of our many friends in Hawaii and Oregon. Thank you, Bill. If ever there was a time to feel the comforting presence of old friends from afar, this is it. We’re all in this together, just over varying distances.